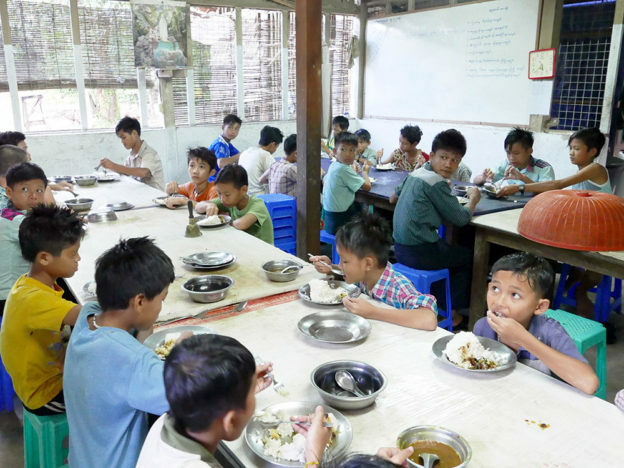 St. Bruno Orphanage for boys was established in 1993 by the Little Brothers of St. Francis Xavier (SFX) in a village tract of Pathein. It started with 5 orphans and grew to 38 orphans and boys from poor and single parent families in 2013. Over the past twenty years the orphanage has been relocated several times due to the lack of a permanent building. In 2012, it moved back to the original site which it had occupied in 1998. This place, close to the rubbish dump of Pathein, had been recognized by the government as an orphanage and it has plenty of space for gardening and pig-breeding. The boys are between 4 and 24 years of age. Some attend Kindergarten, a few study at university and the other boys attend different levels of schools. Two Catholic brothers are in charge of the Orphanage, they care for the boys and live with them. They help the boys with their school education and studies with private teaching and tutorial lessons. In addition, the brothers instruct the boys on morality and good citizenship to strengthen character and self-confidence. The brothers take care of food, education fees, health care and other expenses. Two kitchen helpers prepare the food for the boys and under the guidance of the brothers the boys grow vegetables in the large garden and breed pigs to complement the daily diet. 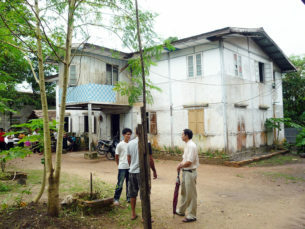 Unfortunately, the old building was in very poor condition and the boys were in urgent need of better housing. The old building was small, the roof was leaking and the windows, walls and floors were decaying; the adjacent kitchen and dining room could hardly resist wind and rain. The condition of the house was unsafe and harmful to the health and well-being of the children, both physically and mentally. Jointly with two donors (USA and Asia) People In Need financed a new building for the boys. The construction started in early 2014 and the Catholic Bishop John Hsane Gyi blessed and opened the new building at the St. Bruno Orphanage for boys in December 2014. Now, the 38 boys have a suitable place to live, attend school and to study. To improve the future food supply, the boys started poultry farming with a donation of 500 chicken and intensified gardening and pig-breeding.